"Charlotte County East, South and Cecil Webb Area, Punta Gorda, Florida Real Estate"
In The Charlotte County and Cecil Webb areas, more than one MLS Board has property listings. Some agents belong to 2 or more boards like we do and put their listings in all local MLS data systems. Not all agents do this, so we are providing you with access to the 3 most relevant real time MLS listing search tools. Englewood Florida MLS search engine. For Charlotte County East, South and Cecil Webb, Florida MLS areas select, P109-East County Central, P110-Cecil Webb Area, P111-South County Central. Press your CONTROL KEY to select more than one area together in one search. Cecil Webb Area- The Babcock-Webb Wildlife Management Area, has 79,000 protected acres. Gorgeous Webb Lake encourage hiking, fishing, boating or just a scenic family drive. Adjacent Babcock Wildlife Adventures can take your family into the Wild West of Florida with swamp buggy tours of cattle and alligator farms, cypress swamp and habitat for deer, wild turkeys and Florida panthers. Punta Gorda is a charming and historic waterfront town. It is the only incorporated city in Charlotte County. More than 100 years old, Punta Gorda features a quaint downtown with cobblestone streets and gas street lamps, with a 19th century Spanish charm. The city has acquired a State Historic District status, but Punta Gorda has more than history to draw visitors and new residents. The newer subdivisions include Punta Gorda Isles (PGI), Burnt Store Isles (BSI), Seminole Lakes, and Burnt Store Meadows. The city's economy ranks highest in the country. 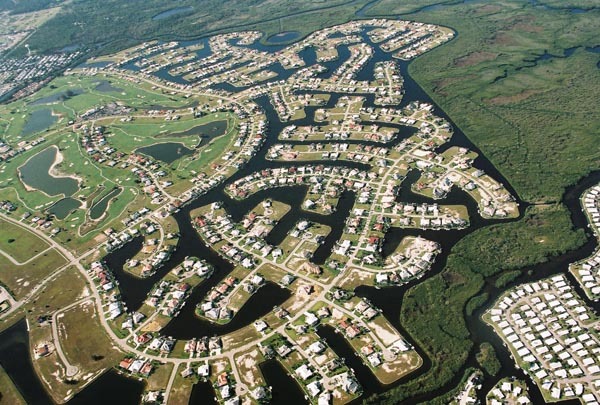 The population of Punta Gorda is approximately 17,000. The city consists of two parts, the original historic district with it's old quaint homes and shops, and the newer subdivisions of Punta Gorda Isles, Burnt Store Isles, and Seminole Lakes. 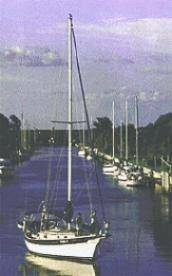 Most of the subdivisions are located on a network of deep salt water canals, providing sailboat and power boat owners quick and easy access to Charlotte Harbor and the Gulf of Mexico. Many homes and condos are located on or near Golf courses. Many of these are deed restricted communities with city water and sewers, paved streets, power, cable, and telephone service. The canal lots in the Punta Gorda city area all have concrete sea walls maintained by the city. All residential improvements in the Punta Gorda City limits are upscale and are tightly controlled by the building commission. The vast amount of the land is zoned single family residence with several pockets of upscale Condo developments. There are many shopping centers in the area, the most famous of which is Fisherman's Village and Marina with its specialty shops and restaurants. The community is noted as an art center in Southwest Florida. The Charlotte county Visual Arts Center is located in Punta Gorda adjacent to Fisherman's Village. Housing options in Punta Gorda include the waterfront homes of Punta Gorda Isles, the exclusive waterfront and golfing community of Burnt Store Isles, and a vast selection of newer and historic homes. Three bedroom waterfront homes start around $450,000. Punta Gorda sits right on Charlotte Harbor. On a larger scale it is right between Fort Myers to the south and Venice/Sarasota to the North. Englewood lies on the Coast to the Northwest and Port Charlotte sits immediately to the West over the Peace River Bridge. Punta Gorda/Port Charlotte has three fine hospitals with many more close by in Englewood, Venice, Sarasota and Ft. Myers. Popular local boating and fishing destinations include the Myakka and Peace Rivers, Charlotte Harbor, Boca Grande Pass and the Gulf of Mexico, Cayo Costa, Punta Gorda's Fisherman's village, the Intracoastal Waterway, Captiva, Sanibel Island, Englewood Beach, Venice Beach and Cabbage Key. Punta Gorda Florida Street Map Punta Gorda City Government Fisherman's Village FREE Property Value Analysis! Punta Gorda, Port Charlotte MLS search engine. Select the Property type along the top of the search page. Select the Area and other features, then click on the SEARCH button on the middle right side. For Charlotte County East, South and Cecil Webb MLS areas select, P109-East County Central, P110-Cecil Webb Area, P111-South County Central. Press your CONTROL KEY to select more than one area together in one search. Florida combined MLS IDX search by city and zip code. Charlotte County East, South and Cecil Webb area listings are found in the Punta Gorda 33955 and 33982 zip code city areas. You may select more than one zip code city area by using your control key. This data could be up to 24 hours old. The Property Feature check boxes do not always function as expected, especially in the Vacant Land Property type.